When I was in schools – from the elementary to the graduate – the N-word was commonly used in the media, I read it in textbooks, heard on TV. But that was in a different country. At least at that time, Russia was very supportive of the fight of Black Americans for having the same rights and social status as White Americans. On one hand, Internationalism was a key element of the Communist ideology. On another hand (but that I realized much later) top USSR politicians followed the old rule “the enemy of my enemy is my friend”. 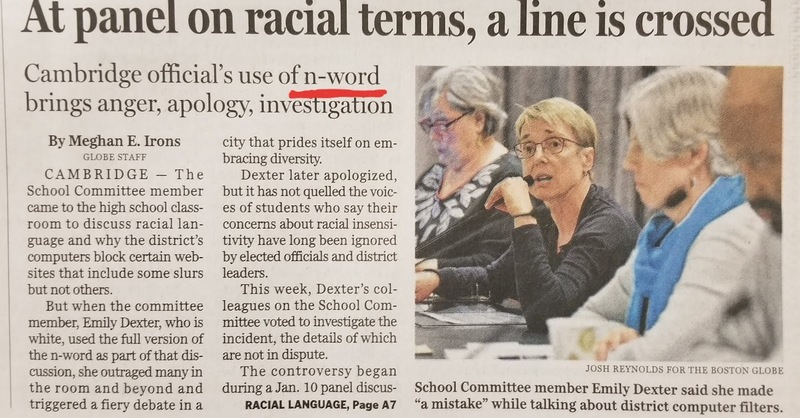 When I moved to the U.S., for a long time I did not know that using the N-word by whites was culturally not allowed. And when I learned that fact I just shrugged it off – OK, whatever, every country has its own rules. Recent events involving black faces (or this one) and the use of N-word sparked a media wave which attracted my attention to the matter. I got curious about the history of this cultural phenomenon. Of course, I Googled it. The history of the word itself is pretty straightforward, but the reading did not help me to learn when and why the N-word has become forbidden for the whites. I do understand the cultural effects of the word, and the psychological reasons for African Americans to impose/demand the sole usage of the word. I just don’t think this helps African Americans to win their fight for – well, whatever they want to win. That may sound powerful, and may be even seen as a victory, because, kind of, you won the right for the sole utilization of the word over your “enemies”. But is it really a victory? “We live in poverty, our schools are underfunded, our people have no prospects of having a good job, but, man, we can say the N-word, and they cannot! We won!” (this sentence represents a purposeful exaggeration). To me this looks more like a quasi-victory, a pretend victory, or a fake victory – not sure about the best term (yes, I may see things in a dark way, but my personal policy is "It's better be prepared for the worst-case scenario and be happy it didn't happen, than hope for the best and face the unexpected downturn). It only makes people feel good about themselves, without actually making them living good. It deflects energy, and intellect, and efforts from things that are actually important for African American community. According to a definition, racism is actions guided to discriminate people of a certain race. Some actions which excite a heated discussion, like painting a face, or dressing a certain way, have nothing to do with racism, but a lot with juvenile stupidity. 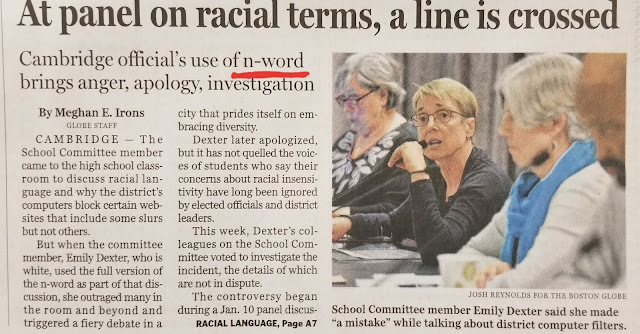 As I already mentioned, I would really like to know when and why this word has become the N-word in its current usage. Some people believe that crack-cocaine was used specifically to suppress Black American population. I doubt the N-word has been selected specifically to diverge the attention from important issues, but it sure seems to me that it works exactly like that. Russians say “You can call me a kettle, but just don’t put me in an oven”. Because people’s actions are much more telling than people’s words. Or, people’s words are much less important that people’s actions (Trump!). Focusing on who can and cannot use some words or outfits only seems important, but in realty those actions make no positive difference for anyone in the African American community. And BTW: so far I have not read or heard anyone in the media who would be advocating the same view as expressed in this piece. P.S. I know, it is a risky post, but it is honest. Slavery is bad, awful, inhumane. However, the human race has a very long history of slavery. Many wars ended up by bring slaves to the country of victors. Vikings were using slaves in their villages. For centuries Russia had a cast of slaves. Slaves, and then serfs existed in Russia until 1861 - almost the same year when ... you know. Those slaves were not brought from other countries, they were Russians. But their owners could do, and did, to the slaves whatever they wanted to do, even bad, awful, inhumane things. Everyone who thinks that African Americans were the only people suffering from slavery is simply wrong. exploitation. From the general point of view, there are only two forms of human interaction: exploitation of one person by another person; or collaboration between different persons. It's either - or. So, when choosing what politician to support, ask yourself, does this guy want to exploit you, or he/she wants to collaborate with you? And judge by the actions, not by the words, because people who want to exploit others always lie. Always.